After the world-wide success of a campaign to store emergency contact numbers in mobile phones, the Suffolk paramedic has come up with a new idea. Bob Brotchie, of Mildenhall, came up with the ICE, which stands for in case of emergency, scheme for phones. Now he is setting up a system for people to register medical details and contact numbers on a database, and to then carry a membership card. 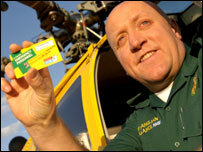 For every card sold, a donation will be made to the East Anglian Air Ambulance. Mr Brotchie said calls for a more secure, robust and sophisticated system for storing emergency contact details had led him to devise the ICE cards. "Many people have PIN codes in their mobile phones, or they were worried that the phone would be thrown clear or damaged in an accident," he said. "So we came up with a system where people register their medical details and up to four emergency contacts on a secure database. "In return, they receive a plastic wallet card, key fobs and stickers which just display a membership number and a free phone number." The card will cost £15, and a donation of between 50p and £2.50 will be made to the air ambulance, which costs £65,000 a month to run. The original ICE concept has had the backing of MPs and governments in the United States, Australia and Singapore.